JSU versus SU game day ball presented during half-time acknowledging JSU as the fanraising champion! 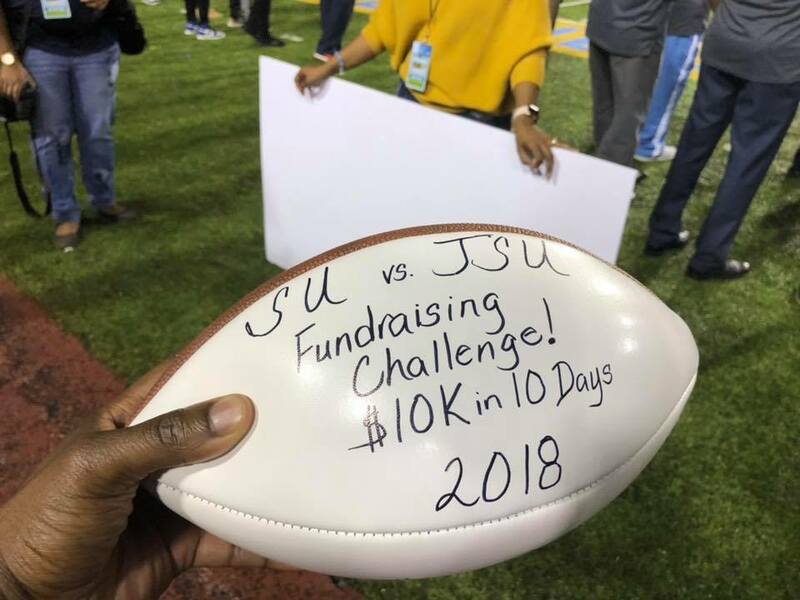 JSU recently won the United Way FanRaising Challenge between JSU and SU. Thanks to faculty, staff, students, and alumni for their contributions in support of this 10-day competition. Together, both schools raised over $5,000. The United Way of the Capital Area (UWCA) will use the funds raised from the challenge to support efforts in the Shark Tank Experience Competition. UWCA and supporting partners are sponsoring a regional Shark Tank competition for tri-county area students. The purpose of the Shark Tank initiative is to promote creativity, innovation, and college readiness through Project-Based Learning (PBL) utilizing Science, Technology, Engineering, Art and Mathematics (S.T.E.A.M.) based entrepreneurship development and cross-collaboration among scholars. Mentored by teachers and entrepreneurs, students from Hinds, Madison and Rankin counties will have an opportunity to design a S.T.E.A.M product or service. The design should speak to a critical social issue in the community and will be presented to a panel of judges during a culminating event in April 2019. Students should anticipate gaining leadership, marketing and analytical skills needed for the innovational economy of the 21st century.